Hello! Today I’m going to show you how easy it is to add a Google form to your WordPress website. Forms come in pretty handy on your website. You can collect subscriber information, provide quizzes, and of course use them as a way to allow visitors to get in touch with you so you can get back to prospects regarding any questions or concerns they may have. I know many of you have voiced your dismay when adding contact forms via plugins to your site. Sometimes they just don’t want to play nice. For example, the emails you collect can fall into spam and when you contact your host, they might blame the theme or vice versa. This isn’t fun and can be very time-consuming. Which is why adding a Google form to your WordPress theme can be a great workaround if you are struggling to get your contact form or a similar plugin to work ASAP. Just in case you haven’t used Google’s online suite of tools, Google forms offer a great way to collect information from your followers or customers. What’s cool about Google is it lets you collect all kinds of information that you can even use to create spreadsheets, simple quizzes, job applications, or for simple contact info. It’s pretty robust and has many applications. In this article, we will show you how to bypass the startup struggle and get Google Forms added to your WordPress website with little headache. There are 3 different ways you can do this. You can copy and share the link in an email — which doesn’t pertain to your website necessarily, but it is an option. You can create a link to the URL directly to your website on a button or in a text box. Or you can directly embed the form on your site so users won’t have to leave to complete the form. The bonus to this is you can even brand it so it looks like the rest of your site. Cool huh? I’ll show you how to do all here in a bit, but for now, let’s get familiar with Google Forms first. First of all, if you want to take advantage of Google Forms or the broader suite of online tools, you must have a Gmail account — which is free. Once that is set up, you are good to go. Next, navigate to Google Forms. Once on the site, you can select from several template choices. Remember you can customize them once you pick one. Google gives you lots of choices and templates. Events, RSVP, Quizzes, Sign-ups, just to name a few. A tutorial on how to take advantage of these applications definitely warrants its own article. For the purpose of this tutorial, I’m going to use the contact form and show you a few ways you can customize it. Below is the basic contact form template. It has some basic fields on it but what’s cool is you can delete/add fields, questions, images, and videos. What I love about these forms is that it’s super easy to delete or add different fields. In my video, you can see all the different options you have. It’s pretty impressive what’s possible with these forms. You can choose the kind of answer you want the user to use, whether it’s a short, long, a comment, or multiple choice. If an answer to a question is mandatory, you can toggle the “required” button. This way, the user cannot submit the form without answering the question. Which is nice to have if you are looking to get specific information. This feature is super helpful if you want to keep your color scheme or related elements in line with your branding. Below you can see how simple it is to change the theme colors. All you need to do is click on the artist palette icon and you can choose the color that works best or type in your color code. You can even delete the header, add a different one, or upload one you created yourself. This is great if you want to keep the theme consistent with the brand or look of your website. When you are ready to see your form in preview click the eye icon next to the artist palette icon. Unfortunately, this a downside to using Google Forms. There is a limited number of fonts you can use. This can be disappointing if your font style is directly related to your brand. If your font style is important to your branding I’d recommend contacting Google to see if there is an extension to give you more font choices. There are a few different ways you can share your form with users. All are pretty simple and straightforward. You can copy and paste the link where you like. For this example, we are going to copy and paste the link for this button I created in a Divi Theme. Now when someone clicks the button, they will go directly to the Google Form. This is the option most of you will use because it doesn’t take the user away from your site. It’s fairly simple to do and I will also show you how to change the sizing inside a Divi module. First, you need to click on the <> icon to create your embed code. Next, copy and paste the code into your theme. In this video, I’m using a Divi module. Now you might decide you want to adjust the size of the form on your site. You can adjust the dimensions directly on the Google Form. However, if you want to test out changes this can be a huge pain because you would have to constantly update the form and copy/paste the new code each time. I recommend changing the sizing within the code within the theme module. You can see from the example below you can go in there and change the code directly. This will save tons of time and you can quickly see how your form will look without copying and pasting a new code. Once you have the size of the form you want, you can save and test it. On your form, click Responses on the top right. From here you want to check Get notifications for new responses. And now you are all set to get notified via email whenever your form is completed. 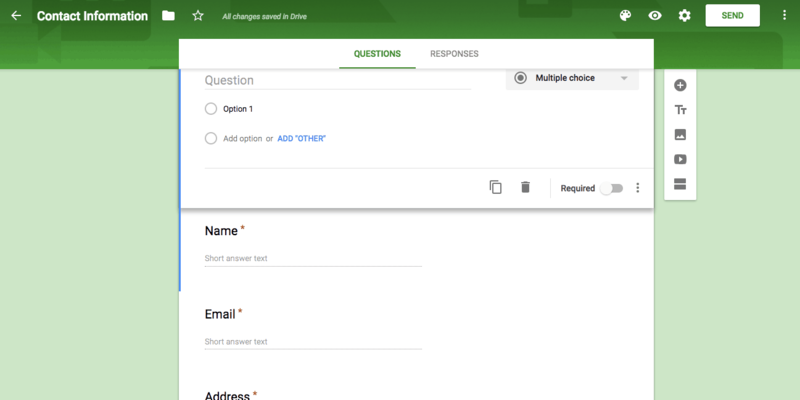 Google Forms are super robust so I recommend playing around with them to discern the numerous ways you can use them. What I love about using a Google Form is the ease and simplicity of adding them to your site compared to adding a contact form plugin. It takes less time and there are less complications. The only downside is you are limited to how much you can customize the look of the form. 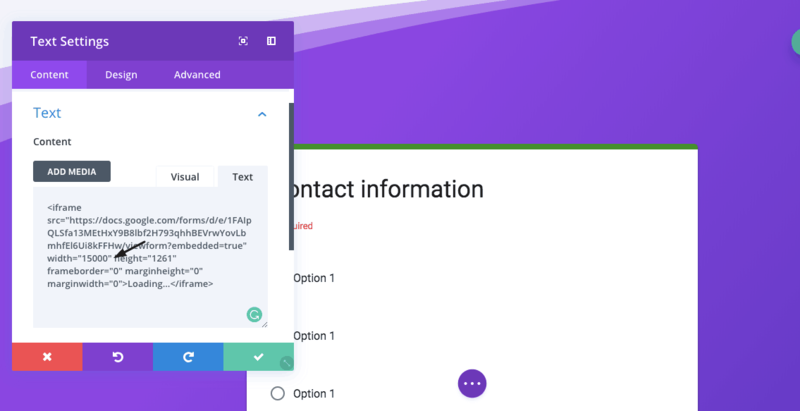 Overall, I highly recommend giving Google Forms a shot so you can see how much easier they are to use and implement on your website. To see Google Forms in action Check out my video below and be sure to leave a comment below about what you think of Google Forms and how you use them on your website.